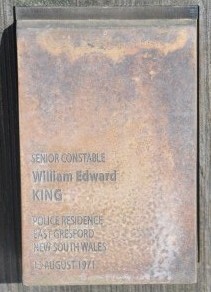 About 6.45pm on 13 August, 1971 Senior Constable King went home to the East Gresford police residence for dinner. When he later answered a knock on the front door he was shot in the chest. He died a short time later. Enquiries later revealed that Senior Constable King had arrested the offender, a sixty-two year old labourer, the previous year for a drink driving offence (DUI). The offender was arrested two hours after the murder of Senior Constable King and later sentenced to life imprisonment. 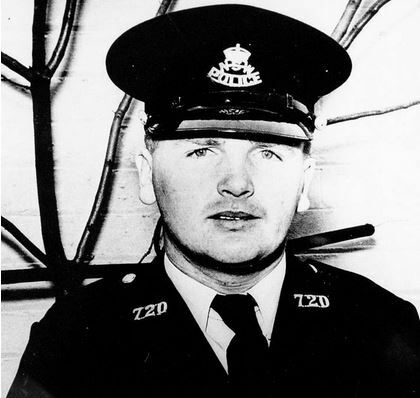 The constable was born in 1933 and joined the New South Wales Police Force on 7 November, 1955. At the time of his death he was stationed at East Gresford. NEWCASTLE, Monday. — Mr Arthur Clement Warr, 63, timber worker, of Church Street, East Gresford, appeared in Maitland court today charged with the murder of Senior-constable William Edward King, of East Gresford, last Friday. The police prosecutor, Sergeant B. Bourne, said it would be alleged that last Friday Mr Warr had drunk at a Gresford hotel then had driven to East Gresford police station and that when Constable King had come from the residence in uniform Mr Warr had shot and fatally wounded him with a .22 rifle. A 62-year-old labourer was committed in Maitland Court today for trial at the Newcastle Supreme Court on November 8 on a charge of murdering a policeman. Mr Wilde, SM, refused bail for the man, Mr Arthur Clement Warr, of East Gresford, who is charged with having murdered Senior Constable William Edward King at East Gresford on August 13. A Gresford station hand, Mr Howard Huckstadt, told the court that Mr Warr had sung out to him, “I shot King Billy”. 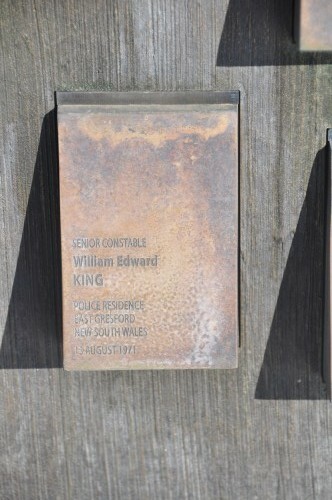 He said he had heard Mr Warr refer to Constable King, of Gresford police station, as “King Billy” before. Mr Warr had asked him if he had any bullets, but he had replied, “no”. He had then said that he had wanted the bullets “to shoot the cop that would come after him”. Mr Huckstadt said he had asked Mr Warr why he shot Constable King and Mr Warr had replied, “He was all the time picking on me”. NEWCASTLE, Friday. — Mr Arthur Clement Warr, 63, fencing contractor, of Gresford, was jailed for life at Newcastle Supreme Court today for the murder of a police constable. He had pleaded not guilty to a charge of having murdered Constable William Edward King, 38, at Gresford on August 13. Mr Warr did not give evidence or make a statement during his trial. Charges of having stolen United States Army clothing at Alexandria railway goods yard on August 17 were made against three australian militiamen, at a court-martial yesterday. Alternative charges of having been unlawfully in possession of the goods were dismissed. On the charges of stealing the Court did not announce its decision. Evidence was that the three men, members of an employment unit, were on duty at the goods yard unloading trucks. A warrant officer said that he saw the accused moving between two lines of trucks in a shed, and on being challenged they dropped several pairs of United States Army trousers. Each of the accused said he had seen the articles lying on the ground and had picked them up, intending to examine the article in a better light. It was unusual, they said, to see anything lying about in the yards. At a previous trial, Private John Henry Hanson, 27 was charged with having unlawfully removed a case containing 24 pairs of United States Army trousers from a railway truck at Alexandria on August 17. Hanson, who pleaded not guilty, said he had not touched any of the clothing. The Court did not announce its decision.